NEW DELHI: For Bhaskar Kumar it is a struggle to name green leafy vegetables found in India for his homework as his staple diet is rice and salt with vegetables served only on festive occasions. 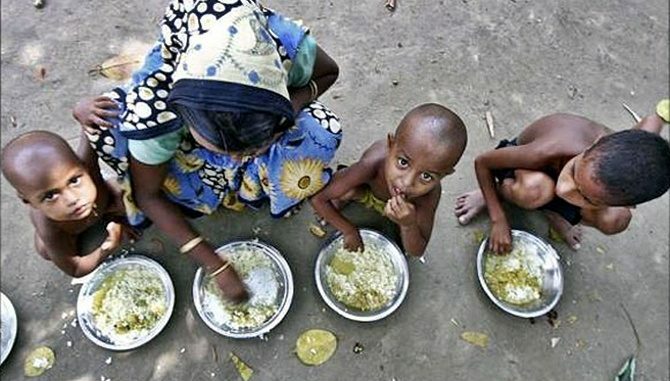 For Bai is among 194 million Indians going hungry daily, according to the United Nations’ Food and Agriculture Organization (FAO) – despite India wasting food worth about $14 billion a year, according to government figures. Bai now works as a daily laborer, earning 120 Indian rupees ($1.87) a day, which is not enough to support her family of eight that includes five children. As the World Economic Forum has highlighted, food production is clearly not the main issue as India needs 225-230 million tonnes of food per year to feed its population – and farm output in 2015-2016 hit more than 270 million tonnes. Under this system the government buys food grain from farmers and distributes it at subsidized prices to the poor, selling wheat and rice at two and three rupees a kg compared to the market price of 12 and 13 rupees. “The superior quality food grains are sold in the black market by the middlemen and the bad quality wheat and rice is given to us at a subsidized rate,” said Ali Sher, head of Pilakhana village in Aligarh district of Uttar Pradesh state. Editing by Belinda Goldsmith @BeeGoldsmith; Please credit the Thomson Reuters Foundation, the charitable arm of Thomson Reuters, that covers humanitarian news, women’s rights, trafficking, property rights, climate change and resilience.